Power traders like the ease and speed of Dorman Direct, powered by CTS. 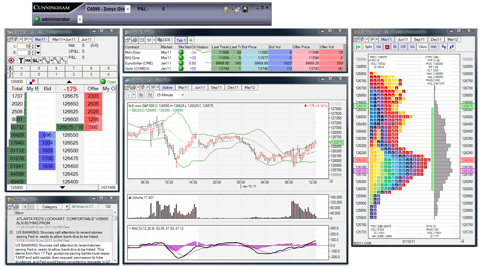 T4 Sniper – client side application that allows you to create, chart and trade custom spreads. Order Templates – create and save Multi Exit OCO and Standard Batch orders. Spread matrix – display multiple months of a given contract with different views such as Calendar spreads, Butterflies and Condor strategies. MOC orders (Market on Close) – select a time to start and stop an order and how many orders to make up the quantity you want to execute. Order Counts – total number of orders that make up the volume at any given price. Market Mode Countdown – display in seconds how long before the next market mode change, ie the number of seconds before preopen or close.